First, the bad news: Experts say there's a possibility that the housing situation could get worse. Just how bad is it now? According to data from the California Association of Realtors, just 20 percent of households in Alameda County can afford the median priced home, which, as of December 2017, was $862,000. And the median rent in Oakland jumped more than 50 percent between 2012 and 2017. It's now $2,950, according to Trulia. Building new housing is considered crucial to relieving pressure on the housing market, because there just isn't enough to meet demand. And while there have been thousands of new units added to Berkeley and Oakland in recent years, with thousands more on the way, everyone agrees this isn't nearly enough, as the Bay Area has been underbuilding for decades. According to the rental site Apartment List, the Bay Area housing market is the nation's most undersupplied market, and it's estimated that California needs 3.5 million homes by 2025. "There's a shortage of labor around the nation and especially in the Bay Area," explained Ken Rosen, chair of the Fisher Center for Real Estate and Urban Economics at UC Berkeley's Haas School of Business. Part of the problem is that the region's workers can't afford to live here and are forced to commute from the outer reaches of the Bay Area. But the biggest risk to the labor market, he said, is the Trump administration's restrictive immigration policies. "A substantial amount of people in the Bay Area — 20 or 30 percent — are non-citizens. They provide a vital labor force. So restrictive immigration policies will be bad overall. That's one thing that worries me a lot. We're constricting the labor supply at the same time we need more people." Because market-rate housing is driven by, well, the market, Rosen said new construction is already slowing in some areas because there's been a leveling of rent growth. The rise in interest rates as well as the potential elimination of the rent control exemption on new housing (via the repeal of the Costa-Hawkins Rental Housing Act) could also slow new construction, he argued. Of course, rent control would help affordability. Other forces have been constricting the housing stock for years and are expected to continue to do so unless there's change. Prop. 13, passed in 1978, froze property values at a home's 1976 assessed value and capped increases at no more than 2 percent per year. When a home is sold, property taxes are set at 1 percent of the sale price (plus the 2 percent annual increase). This has created incentives for longtime homeowners to stay put. And capital gains taxes, which can be as high as 40 percent, are another deterrent for potential sellers, Rosen said. "People are frozen in place because of public policies," he said. The new Republican tax law just worsened this dynamic. "It exacerbates it to a whole new level," said Vanessa Bergmark, owner and president of Red Oak Realty, which has offices in Berkeley and Oakland. The new tax law changed the mortgage interest deduction for new homeowners from $1 million to $750,000. And it capped state and local tax deductions at $10,000 — meaning only those whose homes are assessed at $666,667 or less will be able to write off all of their property taxes. This may discourage people from moving, but probably not for very high-income earners. "People are going to do what it takes to buy. It's going to pull people out who were maybe on the fence," Bergmark said. "Homeownership is going to be further out of reach for a lot of people, and it's a sad thing." Bergmark believes that the European model of home ownership — in which property changes hands primarily because one family member gives it to another — could become the dominant reality here. "It's prohibitive to sell because when you sell you're hit with taxes, and the costs are rising so high. The solution is transfer the property privately. That stops wealth building in the United States." City zoning laws also restrict high-density development. Developer Patrick Kennedy of San Francisco-based Panoramic Interests said he could build thousands of affordable, prefabricated micro-units in a couple years in Oakland if it weren't for the city's zoning laws. "All they have to say is 'yes,'" he said. "Our housing shortage is largely a self-inflicted wound." Berkeley City Councilmember Ben Bartlett, who's also running for state Assembly this year, said wealth disparities could grow even greater if we don't solve the housing crisis. "If there isn't change, Berkeley will mirror most other urban core centers," he said. "It will resemble Brazil or South Africa, with elites living near transit and everyone else living in the depressed exurbs." He said some of his constituents have moved to places like Antioch, but are losing their jobs because of taxing three-hour commutes. And some Bay Areans are moving away entirely. According to data from U-Haul, in California there are more people renting moving trucks to leave than to arrive than any other state. Rosen said that trend will continue. "A substantial number of people are going to say it's too expensive to live here," he said. "That's the number one thing that's going to happen over the next 10 years." They're moving to places such as Portland, Or., Seattle, Wash., and Austin, Tex. So, our housing future looks bleak — or does it? Here's the good news: It doesn't have to be this way. There are multiple efforts underway to change the status quo. "If that passes, we will see thousands of new units built, and we'll see the housing situation improve," said Kennedy. "If it doesn't, I think it will continue to limp along." Of course, cities could go ahead and up-zone areas on their own. Robert Ogilvie, the Oakland director of urban planning think tank SPUR, recommends a carrot-and-stick approach to encouraging cities to build new housing: If cities drag their feet on approving development, they could be overruled by the establishment of a regional appeals body, he said. As for incentives: "We think cities that build housing should get more transportation and infrastructure funds from the state," he said, adding that the requirement should be for in-fill and transit-oriented development. Through his own research, Eric Manou, principal for Berkeley-based Manou Design Group, found that most houses in the Bay Area are occupied by two people with an average size of a couple thousand square feet. "Each person is consuming far more square footage than they utilize," he said. 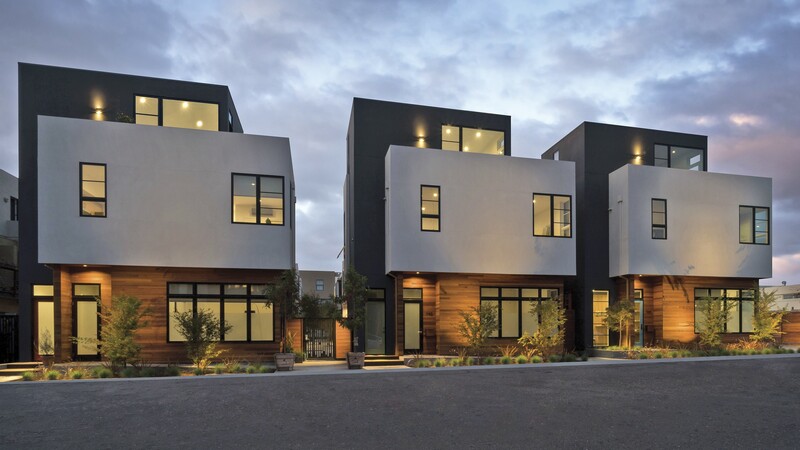 He recently completed a 15-unit net-zero development in North Oakland — the first of its kind in the city — called Atomic City. ("Net zero" means the units produce as much energy as they consume.) Of the three available floor plans, the smallest is 793 square feet and the largest — a three-story live/work home — is 1,264. (Although, at $695,000 and $995,000, respectively, not exactly affordable.) Manou said he could be making more smaller, more energy-efficient homes, but zoning is his biggest obstacle. On the more affordable front, funding was recently closed on the second phase of Oakland's Fruitvale Transit Village, which will include the creation of a new 94-unit multi-family housing development that will provide permanent affordable housing for Bay Area residents whose household income is at or below 20 to 60 percent of the area median income. But to truly solve our housing crisis, and address the displacement of people of color and the widening wealth gap, more drastic measures may be needed. On Jan. 23, Bartlett released a housing plan that focuses on "production, preservation, and protection." The proposal includes various mechanisms — a cap-and-trade-style system, a new carbon tax, and a state bank — to fund affordable housing, plus financial incentives to encourage the hiring and training of low-income and marginalized construction workers, the selling of property to existing tenants, lease-to-own options, and more. "This is meant to trigger significant economic growth that is shared by all tiers of society," Bartlett said. But considering some of the backlash on new development, what will it take to get support for such proposals? "I think it's going to take smart coalition building. Less demonization and embracing the market, and making it make sense for everybody," he said. With the growing homeless population and the ever-widening gap between rich and poor, Black and white, it's perhaps never been more crucial to fix the housing crisis, as it has ripple effects on our economy, jobs, transportation, health, and more.